LA Lynn's: Just Another MANICure Monday... Super Bowl Inspired! Just Another MANICure Monday... Super Bowl Inspired! My nails exemplify just how amped up I was about the SUPER BOWL. This is going to sound CRAZY but did I mention I'm not even a fan of Football! I'm just a FAN of the SUPER BOWL! 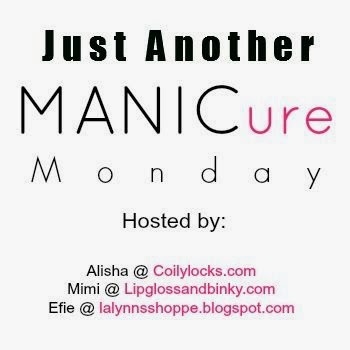 MANICure Monday is a weekly nail polish/mani link-up that will be rotated between Lipgloss and Binky, Coily Locks, and yours truly: LA Lynn's link up! This week Coily Locks is hosting so be sure to link up and show off your Manicure! Also linking up this week to Glitter and Gloss and Well Shut the Front Door! You did that. Sorry they didn't win :-( Your nails won tho!! Haaaa.... okkkk, thanks a lot! Awwww sorry they didn't win, but day-um your nails looked great for the game! Love the nails! I only watch football if Pats are playing. I love your nails! So creative!!!!!!!!!!!!!!!!!!!!!!!!!!!!!!!!!! I wish I did my nails to even link up!! But I just don't paint them. I one like 4 nail polish bottles. I love the nails...I felt bad for the team, I went to bed. Thanks Lyn for always stopping by on my blog post. I xoxo and take care. Thank you and of course... Love your STYLE! Um….this is insanely awesome!! Sports aside, what a fantastic colour combo!! And did you paint the numbers yourself?!? They're perfect!!! If you do a link up this week, give me a yell and I will link with you all. Hope you are STILL linking... The link for this week is LIVE. Thanks! I don't do nail painting, but honestly this looks good. Love the creativity. You got skills!! love it!! Mamanista Friday: Happy Valentine's Day! Just Another MANICure Monday... AKA Inspired!